Please copy the link below into your browser to preorder your apparel prior to the start of tournament. Apparel will be delivered to your first game site as soon as we can. To make it easier, try to order as a team rather as an individual. Also, please include all the information asked for during check out. We will be selling a limited amount of dry-fits only during the tournament. Youth Tournament Update - Online Registration Now Available! Due to all the flooding and wet weather that has been portrayed on Nebraska by national news, all of our fields are playable and not subject to flooding. As you can see below, we have limited number of spots remaining for this tournament. Registrations are heating up; we appreciate all the teams that have entered the Battle of Omaha. You can now go online through the links below to sign up and pay by credit card as we are now accepting online registrations. If the links do not work; go to www.usssa.com and search for the Battle of Omaha tournaments. Once you are registered, you will work through Battle of Omaha (Mike) for your hotel accommodations. Please check the "Who's Coming List" as well; if teams are not registered and/or do not have their roster on-line, they cannot be added to the USSSA website. You may be asking yourself why the difference in number of teams that is shown on USSSA website. The spots below by age is what is left after adding in those teams that have not yet posted their roster or do not have their USSSA ID; we do not want to oversell this tournament. 2019 Battle of Omaha Registration is NOW Open!!! Check out the Events Icon for all the information for this age group under "Tournament", then "My Tournament". Here in Nebraska we play Legion baseball for our 17 and 19uu groups. Although we are under the Legion umbrella, we take teams of all affiliations for the Battle of Omaha. The one cavat that we have is birthdate eligibility that we go by for these events. The Battle of Omaha is please to announce its partnership with USSSA Baseball. This partnership started in 2011 as each of our younger tournaments will be considered NIT Events. The tournaments that will be USSSA sanctioned are our 10's, 11's, 12's, 13's and 14's. Best of all, we are offering this at an awesome price! The entry fee includes gate fees for all coaches, players, parents, and fans; and 1 booklet of 10 General Admission tickets to the CWS. A reminder, that all registration forms are located under the handouts icon. TD Ameritrade Park is located at 1200 Mike Fahey Rd, named after Mayor Mike Fahey who was instrumental in getting the new stadium downtown. 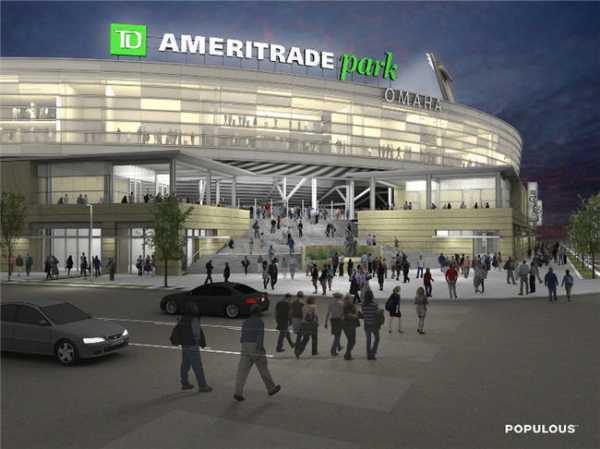 Ameritrade will hold 24,000 fans. The outfield backdrop shows the beautiful Omaha skyline. Teams attending the Battle of Omaha events can purchase their general admission CWS tickets through the Battle of Omaha. Tickets come in a booklet of 10 for $90.00. The GA tickets are good for any game, however fans must wait in line to use them as they are first come, first serve. They will allow the first 5,400 fans in the gates. To order your team tickets contact director Scott Hodges - robert.hodges@ops.org on the High School side or Mike Reggio - 5reggio@cox.net on the Youth side. ©2019 Battle of Omaha Baseball / SportsEngine. All Rights Reserved.